How to Export BOM to an Excel Spreadsheet? This is a guidance on how you export BOM to an Excel Spreadsheet, which makes your more easily to manage your products. 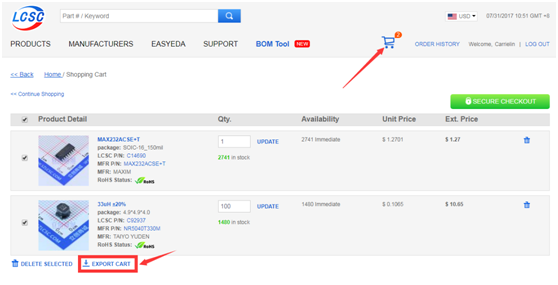 Log in LCSC site and view your ORDER HISTORY, find the order you want to export and click the BOM icon to download the whole order in excel format. Log in LCSC site and enter your Shipping Cart, hit the EXPROT CART to export your product from shipping cart to an excel spreadsheet. If you run into any other questions, definitely let us know, we are always here to help.